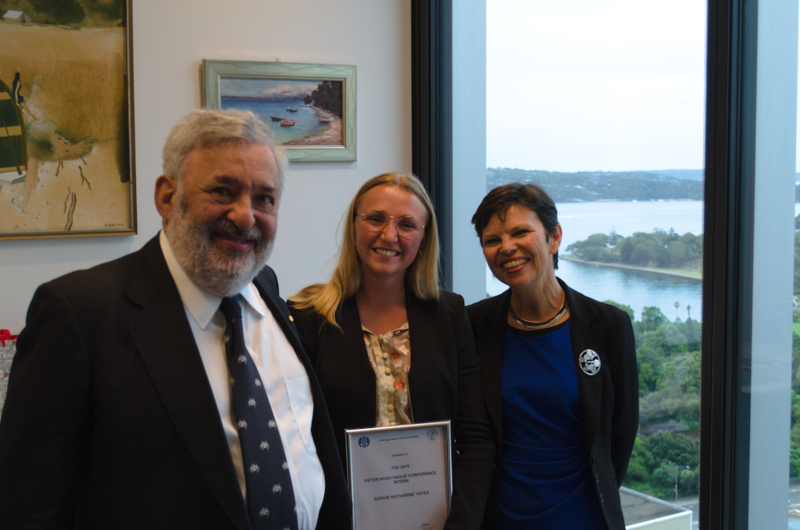 The Australian Institute of International Affairs and the International Law Association (Australian Branch) are proud to announce that the 2019 Peter Nygh Hague Conference Internship has been awarded to Sophie Yates. The Internship supports a graduate or post graduate student from an Australian law school to undertake an internship with The Hague Conference on Private International Law (The Hague Conference) in the Netherlands by providing funds to contribute towards living expenses and cover the cost of travel. Sophie Yates graduated from the Australian National University (ANU) with a Bachelor of Arts and Bachelor of Laws with First Class Honours in November 2017. Throughout her studies, Sophie has had a strong interest in private international law, which was particularly developed through her completion of the ‘Conflict of Laws’ course at ANU. This interest led to her honours thesis on the ‘foreign act of state’ doctrine in Australia, in which she developed a set of rules and exceptions to guide Australian courts that are asked to form a view as to the legality of foreign government conduct. In addition to her outstanding academic achievements, Sophie has a range of practical legal experience. Sophie is currently working as a tipstaff to the Honourable Justice Stevenson in the New South Wales Supreme Court and was admitted as a solicitor of that court in July 2018. Additionally, during her university studies, she was a paralegal at Sparke Helmore Lawyers and HWL Ebsworth, and completed a summer clerkship at Herbert Smith Freehills. Sophie’s academic and professional excellence is complemented by her language skills and overseas experience. During university, Sophie studied an intensive course in Commercial Law at the London School of Economics and went on exchange at Kobenhavns Universitet to study Danish and European Union law. Additionally, Sophie majored in International Relations and minored in Spanish Language and Culture in her Bachelor of Arts degree. With her strong interest in international law, academic excellence and professional experience, Sophie is sure to excel in her work at the Hague Conference. A highlight of that work will be preparing for, and attending, the Diplomatic Session for the Adoption of the Hague Convention on the Recognition and Enforcement of Foreign Judgments in Civil and Commercial Matters. For further information about the Peter Nygh Hague Conference Internship please see Nygh Internship. Applications for the 2020 award will close on 30 September 2019. The Peter Nygh Hague Conference Internship is an award in memory of the late Hon Dr Peter Nygh AM, a leading international lawyer and former judge of the Family Court of Australia. Dr Nygh was also an Australian delegate to, and a rapporteur of, The Hague Conference. In 2002, he was appointed a Member of the Order of Australia (AM) in part ‘for service to international law, particularly through honorary assistance to The Hague Conference’. Dr Nygh’s family donated funds to establish the Peter Nygh Hague Conference Internship. An additional $50,000 was donated by the Commonwealth Attorney-General’s Department, and Resolve Litigation Lawyers generously supports the administration of the award. Further donations are being sought to support this initiative. All donations are tax deductible. The Australian Institute of International Affairs was established in 1933 as an independent non-political body to promote an interest in, and understanding of, international affairs. The AIIA operates nationwide with 1,300 members across seven State and Territory branches. The AIIA provides a forum for discussion, and educates and disseminates ideas via its journal Australian Journal of International Affairs and book series including Australia in World Affairs. The Governor-General of Australia, His Excellency General the Hon Sir Peter Cosgrove AK MC (Retd) is the AIIA’s Honorary Visitor and Patron. The International Law Association has over 50 branches worldwide and a growing membership of academics and practising professionals with an interest in international law. Membership is available to all persons interested in international law. The Hon Dr Peter Nygh AM was a past president of ILA (AB) and was also active in the international organisation of the ILA. While president of the ILA (AB) he promoted co-operation between the ILA (AB) and the AIIA.